is a good way to earn online. In this global market where companies have to face stiff competition, the only way to fare better is by customer's feedback or suggestions. More and more companies are now realizing, that before launching a product or service, its better to analyze its demand and also predict how well it will be received by the target customers. And the best way to do that is through paid surveys. Why "paid" you say? That's just because no one wants to give their honest opinions for free! 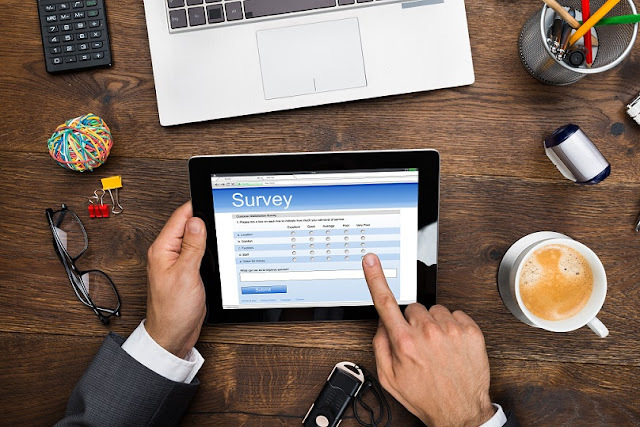 Now not only these paid surveys are for analyzing the demand and reception of a product or service, but also for knowing how much expectations does a product fulfill after its launch. What did the people like in the product, what they didn't like, what more they want, how better the product is in comparison to its competitors etc. are some questions that paid surveys answer to companies. Surveys are also taken for media like advertisements, popular TV shows etc. And these are my favorite ones! Some sites also do experimental, psychological and behavioral surveys. And these surveys usually pay very good amount. Now you know much about paid surveys, so we must move to the next step. I will list some popular websites where you can earn through surveys. Some websites Pay cash via Payal or direct bank transfers, while some give gift cards like Flipkart and Amazon and some have both options for the payment. But whatever be the case, never join a survey website which asks for money in name of registration. They might give you some surveys, but then they are very likely to go scam. So I will only enlist websites which are for free, which I have been using for a while and which DO pay. Note: If you wish you can bookmark this page, as I will be frequently updating it. I guess the name is enough for this website. This website is an Amazon product and it offers the best paid surveys, studies and experiments. Also it offers wide range of freelance works like transcription, translation, voice overs, graphic designing, data entry etc. I have earned as much as $20 per survey on this site, which took me only 30 minutes. Not bad, isn't it? 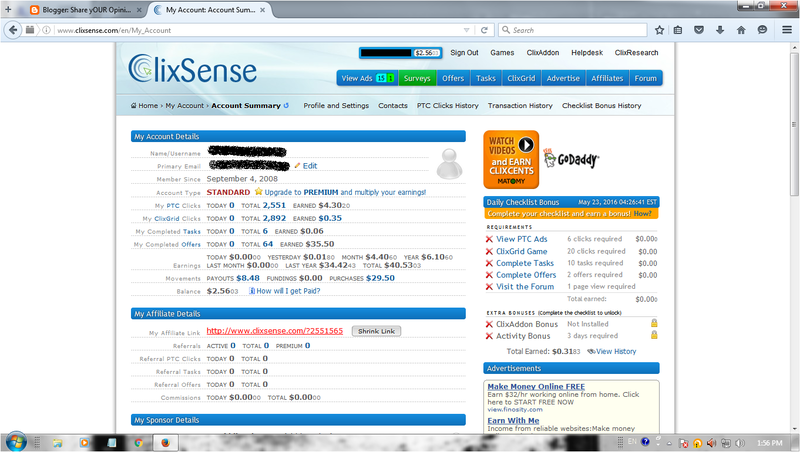 Till now I have earned more than $450 on this site and I am surely not gonna stop at this amount! Don't believe me? See the below screenshot. The best thing is that this site does not charge any kind of transaction fees and is very flexible website. No matter at what time you log in this site, there is always some work to do, some moolah to earn. Just make sure that you submit the required documents for cash payments, like PAN card is must for Indians to receive cash payments. If you don't have these documents, then also no issue as you can receive your payment in form of Amazon gift card (US dollars). There are many websites where you can exchange these gift cards for cash balance. Some of them are CardCash and Raise. When you visit the Amazon Mturk website, then click on "sign in as worker" and then make an account using "No, I am a new customer". After that you can just continue to register your account. 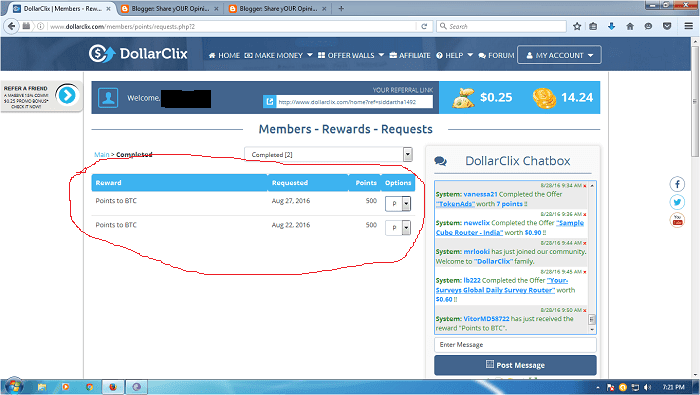 Dollarclix is a website, which all online earners should join. This site has got over 20 popular offerwalls and many survey routers, depending on the user location. Anyone can easily make good amount of money on this site. The best thing is that you can withdraw your earnings through bitcoins also, which is becoming highly popular day by day. Other withdraw options include Paypal, Payza, Amazon, Flipkart. For those who have Paypal account, I will suggest them using it for withdrawals on Dollarclix platform. The reason being that fees is very low (just 1%) and also Paypal won't further deduct any amount from the money sent by Dollarclix. There is an option of instant Paypal in Dollarclix, by which you can get instant payments in your Paypal account through Dollarclix. This option becomes available when you have done minimum of 15 cashouts through Paypal option. But I prefer withdrawing through Bitcoins. 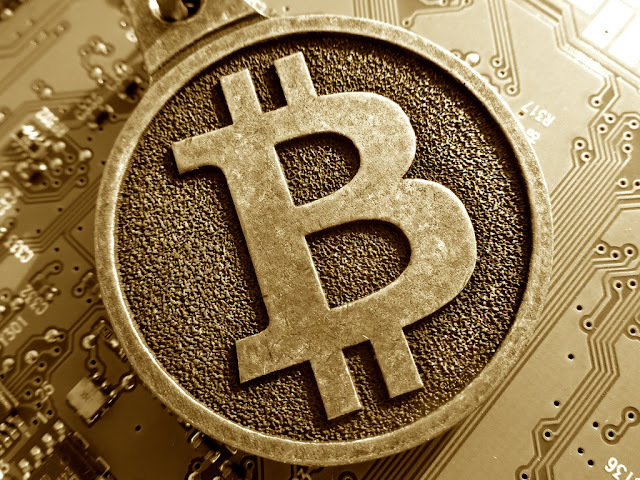 I just love Bitcoins! You can read my special article on Dollarclix here. While doing surveys, you can chit-chat also! I have earned around $12 on this site within a few days itself. And surely the my rate of earnings on this site is increasing. The site's description says "World's No.1 Paid Survey Website", and to large extent I agree with the statement. For me its just behind Amazon Mturk platform. 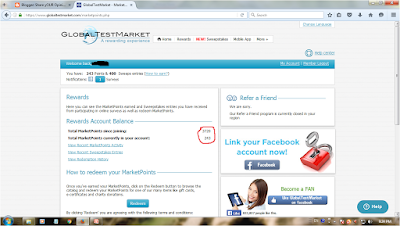 Globaltestmarket is always full of relevant surveys and the pay rate vs. time taken to complete survey is very fair. The best thing is that it offers really lot of options to withdraw your earned points. You can order popular e-commerce website gift cards which include Amazon, Flipkart, Jabong, Myntra, Shopper Stop, Westside etc. These gift cards are online vouchers, so you don't have to wait for them to arrive by post. As soon as they arrive in your e-mail account, you can use them. 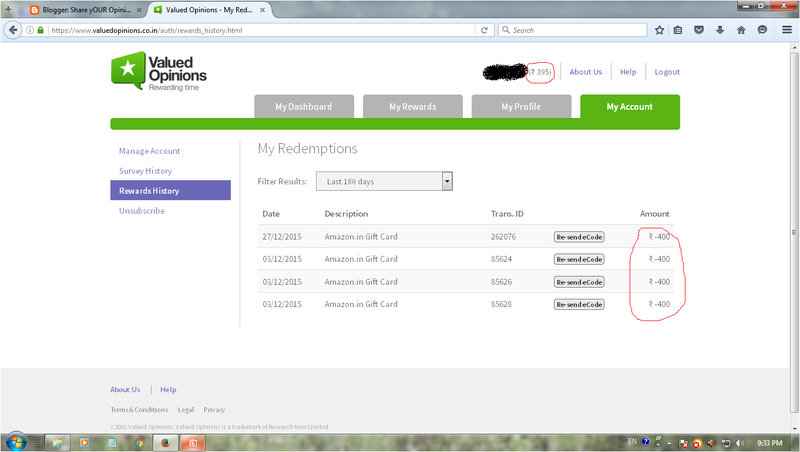 You can also get your earned points converted to Paypal balance, which you can withdraw to your bank account. Or if you are one of those benevolent souls, then you can also redeem your points for Unicef Donation Vouchers! 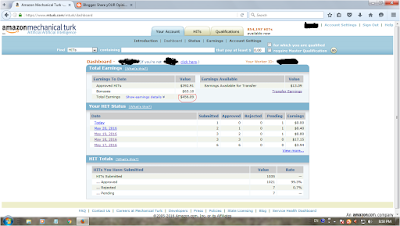 I have earned around 4000 points on this website, which convert to around $60. A good conversion of free time! It is basically a PTC website, which means you get to earn money for viewing ads. I joined this site in 2008, but then I got bored clicking ads and I left. Only recently I came back on this site. And I made the right choice. Because now this site offers lots of surveys to earn money. A survey on this website can pay you as high as $5. This site basically acts as median between many different survey websites so it can provide lots and lots of surveys to you. The best part is that it does not provide any gift vouchers so you have to take the cash! You can withdraw your earned amount through popular e-wallets like Paypal, Payza, Neteller etc. There are many other ways to earn on this site as well. Like you can check the offers and tasks section of this website where you can earn money for viewing a video or installing a popular app on your phone or doing some google search. Just make sure that you take the surveys through surveys option only, and not through offers and tasks, as they pay less for the same surveys. If you want you can also check the ClixResearch link on this website. It offers only highest quality surveys, for which most people don't qualify. The pay is good but surveys are very less. So I just stick with the normal surveys link of the Clixsense website. Feel free to click the image and read the tiny details! I have made around $35 on this website by surveys alone. Now I am regularly doing surveys on this site. Did I tell you that this site also gives referral commission? That is if you introduce someone to this site, then you get commission on their earnings. Don't worry, the commission won't be deducted from your friend's earnings. It is paid by company from its profits. So go ahead, make some money and help others also make money and in return earn even more money! Again a great paid survey website. Valuedopinions is a member of esteemed survey governing bodies like "The Marketing Research Association (MRA)" and "The Market Research Society (MRS)". This website provides high amount surveys from reputed brands like Nike, Microsoft, Google etc. A 5 minute survey can easily earn you $0.25. Support system is excellent. It offers only gift vouchers like Amazon, Flipkart, Ticket Compliments etc. But the good thing is that reward redemption is instant. A must register survey website. 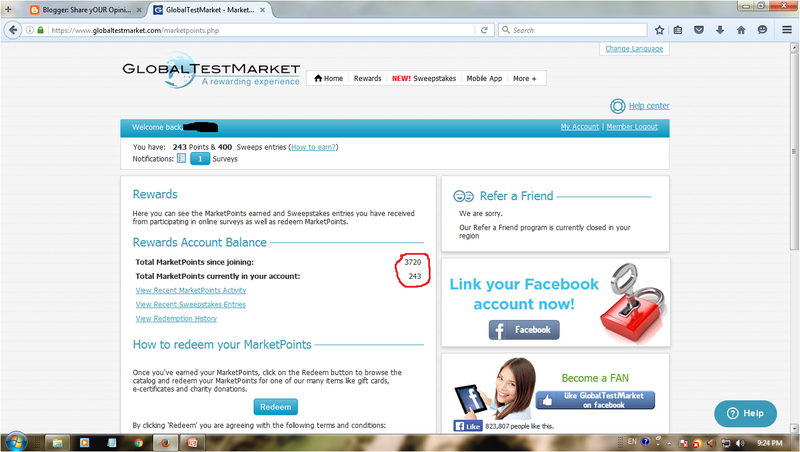 The red circles are my earnings on this site. 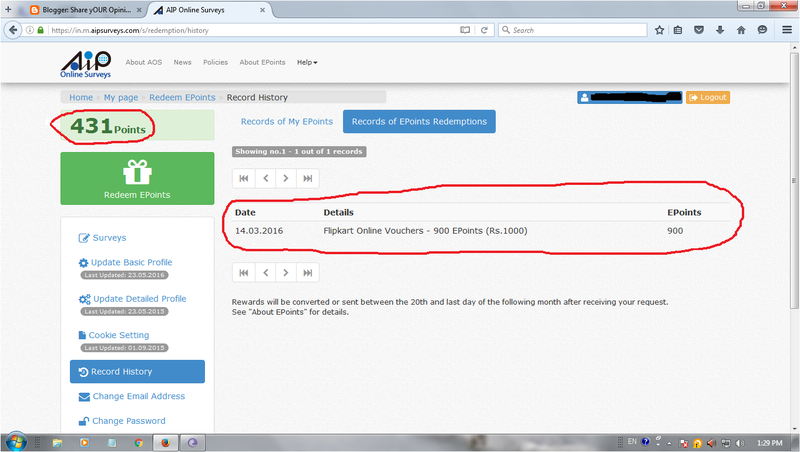 I have earned around 1600 points on this website, which convert to approx. $26. The only negative point of this site is that surveys are just not enough for everyone! This website is also a good site for paid surveys. "AIP Online Surveys" serves business organizations from all over the world, primarily from Europe, the U.S. and Asia. The best thing about this site is that it rewards for every survey you take, even if you are screened out in the initial stage. If you complete the survey then you get full points, otherwise you get some compensation points, which are less in amount but still enough to cheer you up! Another positive point about this website is that if you redeem points above a certain limit then, you even get a bonus on them. Like if you redeem 900 points, then you will actually get rewards worth 1000 points. Isn't that great? This website also does not pay cash, but you can redeem your points for gift vouchers of Flipkart, Lifestyle etc. varying according to your country. Please excuse me for my childish art! 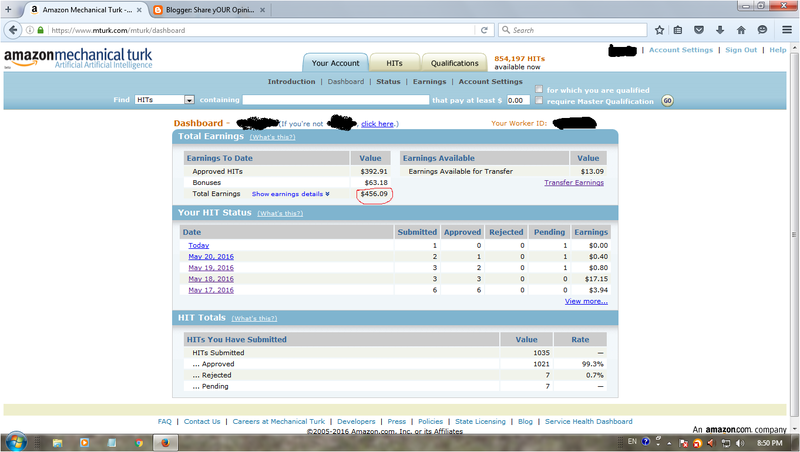 I have earned around 1400 points on this website which are equivalent to $23. Least compared to other websites, but not bad! So these are some of the paid survey websites where you can make money in your free time, or even full time on Amazon Mturk. Do let me know if you encounter any issues while using these websites. And also share your feedback, experience while working on these websites. If you wish you can also post your earning stats related to these websites. As always please share yOUR opinons, views, feedback, critique etc. etc. in the comments section! NOTE: Always give honest answers in the survey and read the questions before answering them. Do not random click the options as some of the question are to check your attention. Have you played Stardew Valley yet?